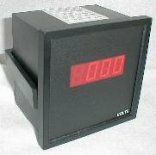 Zenith Instruments manufactures digital panel meters. For custom-designed units, please contact us. The 489 IND series, are a range of 3 1/2 digit Digital Panel Meters able to indicate from -1999 to +1999 on a 14mm red LED display. The 489 IND range can be configured to indicate several options. The 72 IND series, are a range of 3 1/2 digit Digital Panel Meters ble to indicate from -1999 to +1999 on a 14mm red LED display. The 72 IND range can be configured to indicate several options (contact us for further details on this model). The 96 IND series, are a range of 3 1/2 digit Digital Panel Meters ble to indicate from -1999 to +1999 on a 14mm red LED display. The 96 IND range can be configured to indicate several options (contact us for further details on this model). The 48 IND series, are a range of 3 1/2 digit Digital Panel Meters ble to indicate from -1999 to +1999 on a 14mm red LED display. The 48 IND range can be configured to indicate several options (contact us for further details on this model).